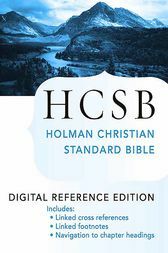 This updated reference edition of the HCSB is optimized for easy reading on digital devices. It includes more than 35,000 links to textual notes, alternate readings, explanatory notes, cross references, and Old Testament citations in the New Testament. The table of contents is organized by headings within each chapter and the corresponding verse numbers, and the ebook file has been specifically formatted to be fast and easy to use.